Komatsu Forklift Australia has recently unveiled its new FR series narrow aisle single and double deep pantograph reach electric forklifts, which features a new environmentally friendly Intelligent Control System. There are three models in the new series, the FR15K "double deep" reach truck with a capacity of 1300 kg; and two single reach models, the F18K and F23K with lifting capacities of 1750kg and 2250kg respectively. All models have a lift height of 8.25m. All models utilise the Komatsu Intelligent Control System which controls the truck AC drive (electric drive) system and the separate AC lift system. According to Komatsu, the system ensures oil flow is accurately measured and infinitely controlled through the company's Hydraulic Control Valve system. It also has a power saver function and regenerative systems that recaptures current during various operations, thus making the new machines environmentally friendly. The models also offer comfort and efficiency with its side stance operator position to provide maximum visibility for both load handling and directional travel. Keypad communication built in with the models provides visual truck setting, travel speed, travel direction, park brake indicator, battery charge indicator, time of day and travel speed. 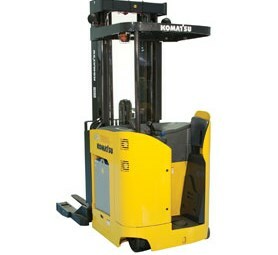 Find Komatsu forklifts for sale. 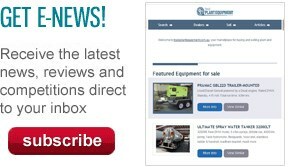 Search for new Komatsu forklifts.